(L-R) Ashleigh Staples, Jeannine Oliver, Trey Hawkins, Keslie Boyles, April Davis, Barnett Wright, Kristen Ray, Rotosha Ward, Jason Gardner, Jarrell Jordan, Kristina Scott, and Ralph Foster. 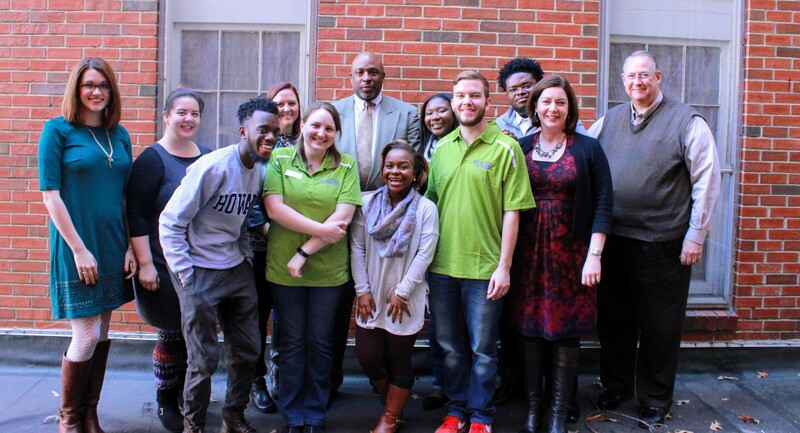 On December 15, the Alabama Possible team had the opportunity to catch up with four college students who have been involved with our Blueprints and Cash for College programs. These Birmingham City Schools graduates shared their college successes with us as well as their plans to improve education for others. Trey Hawkins and Jarrell Jordan graduated from Woodlawn High School in 2015, and both earned the prestigious Gates Millennial Scholarship. Even though their college educations are completely financed through the scholarship, they both recognize how crucial it is for students to complete the FAFSA. Trey is a sophomore at Howard University and plans to become a doctor. “There are not a lot of people like me in the medical field. I wanted to go into that field anyway, but now it is more of a duty or responsibility. If I want to see diversity in the medical field, then I need to help diversify it,” said Trey. He has a fellowship which focuses on making it more affordable for students to study abroad, and he will be studying abroad in London and South Africa next summer. Jarrell is a sophomore at Morehouse College. He studies political science and was selected to be a White House HBCU Ambassador in August of 2016. In January, he will present “The Importance of Education Tour.” The mission of the tour is to inform Birmingham middle and high school students about the importance of education and to teach them about the culture of Historically Black Colleges and Universities. Kristen Ray is a Ramsay High School graduate and a first-year student at Lawson State Community College where she serves as a Blueprints mentor. The Blueprints program at Lawson encourages college success by matching Birmingham City School graduates with near-peer student leaders who serve as mentors. These students are only a few inspirational examples of the talented students that come from the Birmingham community.”Birmingham has some of the brightest kids. We just need to give them a chance,” said Trey.